FACE TO PHASE, a project co-authored by Tzeni Argyriou and Vassilis Gerodimos, aspires to shift – even slightly – spectators’ experience of an exhibition. 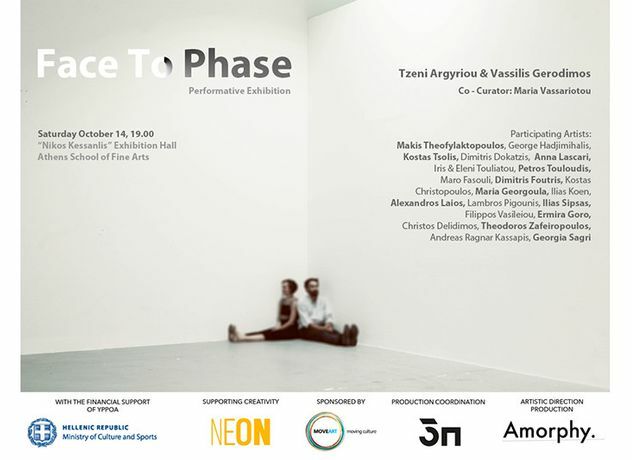 FACE TO PHASE reveals the course of artworks from their arrival at the exhibition space until their departure, illustrating all those invisible stages of preparation that remain undisclosed to the audience. It invites the viewer to be unleashed from the museum-like experience and instead to become both an observer and a part of the overall project, from start to finish. The viewer's relationship to the works and their creators is redefined, as he is encouraged to choose by himself the actions he will follow, as well as the observation points, thus creating his personal course and narrative in space and in the project as a whole. FACE TO PHASE presents to the audience – in a compressed time frame – works by 21 artists, while commenting on the notions of ephemerality and futility that are inherent within the creative process.